Douglas Fairbanks is remembered today as the nimble, insouciant hero of a string of swashbuckling films: The Mark of Zorro (1920), The Three Musketeers (1921), Robin Hood (1922), The Thief of Baghdad (1924), Don Q Son of Zorro (1925), and The Black Pirate (1926). He is the primary subject of a gorgeously illustrated, solidly researched new biography by Jeffrey Vance with Tony Maietta. Proceeding film by film, the authors interweave his life story with production data and summaries of critical reception. While tracing his career, they make an intriguing case that Fairbanks’ 1920s features more or less founded the modern film of action and adventure. In the five years before The Mark of Zorro, Fairbanks made twenty-nine features and shorts. Vance and Maietta are enlightening on this period, but they treat it as prologue to the more spectacular work. Now, as if to counterbalance their book, comes a new Flicker Alley DVD collection, Douglas Fairbanks: A Modern Musketeer, gathering ten of the early films along with a very pretty copy of The Mark of Zorro and Fairbanks’ last modern-day movie, The Nut (1921), made because he wasn’t sure that Zorro would be a hit. (It was.) 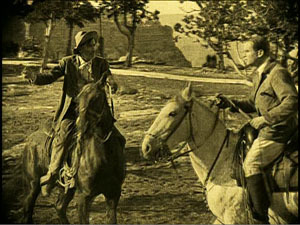 To the DVD package Vance and Maietta have contributed an informative booklet and they offer enlightening conversation in a commentary track for A Modern Musketeer (1917). Before he became Fairbanks, he was Doug, the relentlessly cheerful American optimist. This star image was created very quickly, in films and in public events that made him seem the nicest guy in the country. His manic energy came to incarnate the new pace of American cinema, and his films helped shape the emerging precepts of Hollywood storytelling. There is no guile in him, no hidden agenda. When he’s brimming with delight, as he often is, he flings his arms out wide. In another actor this would be hamminess, but for Doug it’s simply an effort to embrace the world. Any social embarrassments he commits—and they are plenty—he acknowledges with a puzzled frown before flicking on an incandescent grin. 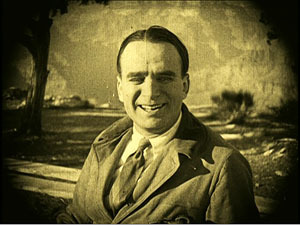 Who else makes movies with titles like The Habit of Happiness (1916) and He Comes Up Smiling (1918)? But how can such a genial fellow yield any drama? Give him an idée fixe, a cockeyed hobby or life philosophy into which he can pour his adrenaline. Now add a goal, something that his obsession blocks or unexpectedly helps him attain. Toss in the staples of romantic comedy: a good-humored maiden uncertain how to tame this creature of nature, a few old fogeys, some unscrupulous rivals. Hardened crooks may make an appearance as well. Be sure to include some tables, chairs, sofas, or horses for him to vault over, as well as some perches near the ceiling or on the roof; Doug feels most comfortable lounging high up. Add windows, for his inevitable defenestration. (In a poem about him, Jean Epstein wrote, “Windows are the only doors.”) There should also be chases. Other comedy stars run because they must. Doug’s joy in flat-out sprinting suggests that he welcomes the chance to flush a little hyperactivity out of his system. At the story’s climax he must save the day, taming his obsession and achieving his purpose while acceding to the claims of the practical world. An early example is His Picture in the Papers (1916). 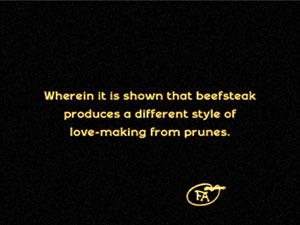 In this satire on vegetarianism and the American lust for publicity, Doug works for his father’s health-food firm, even though he prefers thick steaks. But he’s full of ideas for promoting the product. Doug needs money to marry his equally carnivorous girlfriend, but his father will give him the dough only if Doug can pitch their line of dietary supplements. Doug vows to get his picture in every newspaper in town. While he launches a series of high-profile stunts—wrecking his car, entering a prizefight, brawling on an Atlantic City beach—his sweetheart’s father is pursued by a gang called the Weazels, who try to extort money from him. The two plotlines converge, with Doug stopping a train wreck and winning a place on the front pages. (In a sly dig at the press, each news story contradicts the others.) The movie is a little disjointed, but several scenes are remarkable, not least a boxing match in an actual athletic club before an audience of cheering Fairbanks pals. And there is more than one funny framing, notably a nice planimetric one showing all our principals lined up and reading different newspapers celebrating Doug’s triumph. 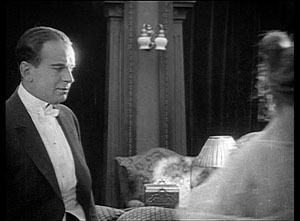 As the title indicates, in The Matrimaniac (1916) Doug’s goal is elopement, which he pursues obsessively. He evades a rival suitor, his girlfriend’s father, a sheriff, and a posse of city officials in order to tie the knot in a gag that must have looked radically up-to-date. Reaching for the Moon gives us a more philosophical Doug, a naive disciple of self-help books that urge him to strive, to concentrate, and above all to keep his eye on the most supreme goal he can imagine. He ends up in New Jersey. Wild and Woolly (1917) casts Doug as the son of a railroad tycoon. Although he lives in Manhattan, he dreams of being a cowboy. His bedroom boasts a teepee, and he practices his roping skills on the butler. Sent out to Bitter Creek to investigate a deal, he encounters the rugged frontier of his dreams, complete with shootouts, town dances, and hard-drinking cowpokes. But all of this is a show, staged by the locals to make him look favorably on a railroad spur. In another twist, a crooked Indian agent uses the charade to rob the bank and stir up an Indian settlement. Now Doug’s obsessions prove really useful, as his cowboy skills rescue the town. “Always chivalrous, always misunderstood,” reads one intertitle in another gem, A Modern Musketeer. Here Doug is possessed by the spirit of D’Artagnan, simply because while he was in the womb his mother was reading The Three Musketeers. He manages to live up to his heritage as he overcomes a philandering rival and a bloodthirsty Indian. 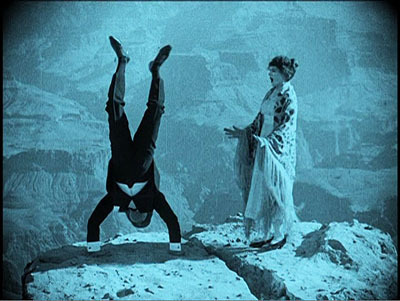 The climactic chase takes place at the Grand Canyon, affording Doug a chance to shinny up and down cliffs and do handstands along a precipice. Doug never does things by halves. In Flirting with Fate, he is a starving artist, out of money and apparently unloved by his girl. The logical solution is to hire a killer to end his misery. Of course Doug’s fortunes instantly change, and life becomes worth living, but then he must somehow find his assassin and call off the hit. Many of the early films show the protagonist fully formed as a cross between a cheerleader and a track star. But Fairbanks made a big success on stage playing a sissy. The task in such a plot is to turn him into a red-blooded man. 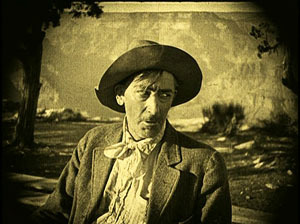 His first film, The Lamb replayed this lamb-into-lion plot, which also served as the basis for Buster Keaton’s first feature, The Saphead (1920). In the Flicker Alley collection, this strain of Doug’s work is represented by The Mollycoddle (1920). Doug is the descendant of hard-bitten westerners, but growing up in England has made him a fop. Coming to America with a batch of wealthy Yanks, he is a continual figure of fun, waving his monocle and cigarette holder. Once in Arizona, however, he’s confronted with a diamond-smuggling racket. He starts to channel his ancestors and turns into a hell-for-leather hero. He allies with a tribe of exploited Indians to capture the gang, in the process indulging in leaps, falls, canyon-scaling, and fistfights in raging rapids. The titles often invoke craziness, vide the Matrimaniac, The Nut, and Manhattan Madness (1916). But this motif is carried to an extreme in one of the strangest pictures of the still-emerging Hollywood cinema. When the Clouds Roll By (1919) crams in enough gimmicks for three Doug stories. First, our hero is neurotically superstitious. He will climb over a building to avoid letting a black cat cross his path. He meets a girl who is as superstitious as he is, so after a session at the Ouija board, they seem a good match. At the same time, however, a psychiatrist is making Doug the subject of a demonic experiment: Can one drive a person to madness and suicide? Through bribes and surveillance, Dr. Metz turns Doug’s life into hell—botching his romance, getting him disowned by his father, and even inducing nightmares. As if all this weren’t enough, the last reel jams in a train crash, a bursting dam, and a flood. Before this overwhelming climax, When the Clouds Roll By isn’t so much funny as eerily paranoiac. The way Dr. Metz’s Mabuse-like scheme enfolds everyone is as anxiety-provoking as anything in a film noir. This dreamlike movie ends on a surrealist note: Doug and his sweetheart get married when flood waters carry a church past them. Across these films, in fact, the Fairbanks persona starts to disintegrate. Somewhat like those naïve Capra heroes of the 1930s (Mr. Deeds, Mr. Smith) who turn into melancholy victims in Meet John Doe and It’s a Wonderful Life, Doug becomes more brooding and helpless. In Reaching for the Moon, his absurd dream of glory is revealed as just that, a dream. When the Clouds Roll By saves itself from despair through splashy last-minute rescues. Fairbanks was evidently becoming uncomfortable in cosmopolitan comedy. His taste for large-scale stunts and tests of prowess led him to the costume sagas of the 1920s. 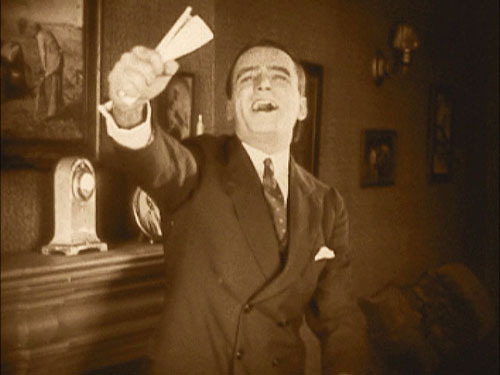 In the process, as Vance and Maietta point out, he cleared the way for Keaton and Harold Lloyd. Both comics would sometimes play obtuse idlers in the Lamb mode, and both would take thrill comedy to new heights. But avoiding Fairbanks’ ebullient optimism, Keaton brought a perplexity to every situation, along with an angular athleticism and a geometrical conception of plotting and shot composition. Lloyd frankly presented a hero lacking social intelligence, afflicted with a stammer or shyness or even cowardice, always desperate to fit in. Both men deepened the possibilities of modern-day comedy, thriving in the niche vacated by Fairbanks. 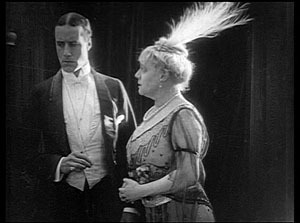 For nine of the early films, Fairbanks had the help of John Emerson and Anita Loos. All three worked on the stories, with Emerson usually directing and Loos writing the scripts and intertitles. The collaboration lasted only about two years, but it yielded some definitive moments in the creation of the Doug mystique. Emerson found his first success acting and directing on the New York stage. 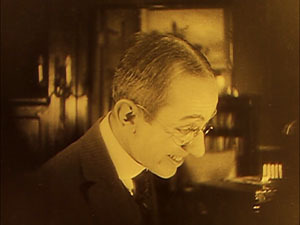 Under Griffith’s supervision he started filmmaking in 1914, with an adaptation of his own successful play, The Conspiracy. I haven’t seen this or most of his other early work, but his 1915 Ibsen adaptation Ghosts, codirected with George Nichols, betrays little of the dynamism that would run through his Fairbanks projects (although The Social Secretary of 1916, without Doug, is lively enough). 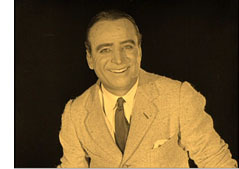 Emerson continued to direct films and New York stage productions until his death in 1936, at the age of fifty-eight. Loos was a tiny prodigy. 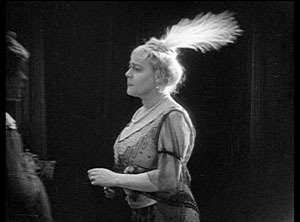 She sold her first scripts at age nineteen, with the third, The New York Hat (1913), directed by Griffith, earning her twenty-five dollars. (Her punctilious account book is reprinted in her 1974 autobiography Kiss Hollywood Goodbye.) 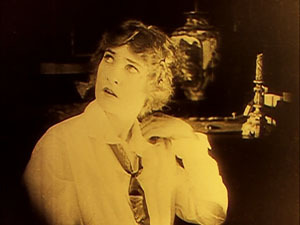 After writing scores of shorts, she moved into features in 1916, when, she claims, Emerson discovered her script for His Picture in the Papers. Clearing the project with Griffith and casting Doug Fairbanks, the team proceeded. This, Fairbanks’ third feature, proved a great success and solidified important aspects of his star persona. 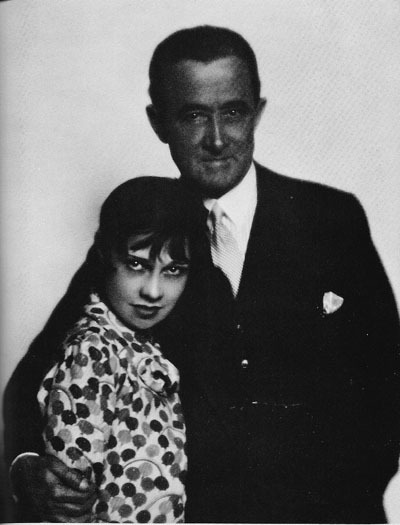 Loos married Emerson, whom she recalled as having “perfected that charisma, which even a bad actor has, of being able to charm his off-stage public.” (4) He called her Bug, she called him Mr. E., and they became a Hollywood couple. They kept themselves before the public eye with interviews and books like How to Write Photo Plays (1920) and Breaking into the Movies (1921). These are full of information about the filmmaking practices of the day. Why did Emerson and Loos split from Fairbanks? Loos says that that Doug had become somewhat jealous of her notoriety. (5) Further, the couple yearned to return to New York. There Loos would hobnob with the Algonquin club crowd and write Gentlemen Prefer Blondes, a successful serial, book, play, and silent film. Eventually she would write plays and return to Hollywood as an MGM screenwriter. 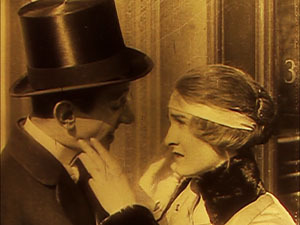 The young suitor and Christine kiss by tapping each other’s cheek with their fingertips. Later the intertitle stresses the more robust wooing program launched by Doug. By the time Loos and Emerson left Fairbanks, the look and feel of their contributions had been mastered by others, notably director Allan Dwan, and smart-alec intertitles continued to grace Fairbanks’ modern comedies. Throughout the 1920s, most comedies would strive, not always successfully, for the cleverness Loos brought to the task. 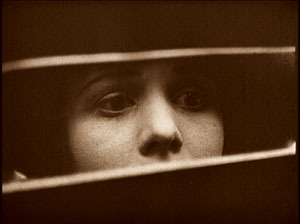 My own favorite in her vein comes in the Lloyd vehicle For Heaven’s Sake (1926). Harold is a millionaire courting a girl working in her father’s mission house in the slums, and one of the titles refers to “The man with a mansion and the miss with a mission.” Such niceties largely vanished when movies started to talk. We can learn a lot about the history of Hollywood from these films too. 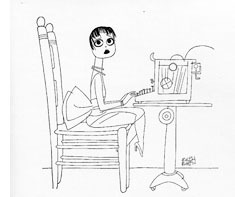 In the 1910s, narrative techniques were being put in place: the goal-oriented hero, the multiple lines of action, the need to prepare what will happen later, the use of motifs as running gags. At the start of The Matrimaniac, we see Doug sneaking into a garage and letting the air out of a car’s tires. Only later, after he has eloped with the daughter of the household, do we realize that this was a way to keep her father from pursuing them. In the course of the same film, the elopement is aided by passersby, and Doug keeps scribbling IOUs to pay them. At the end, the parson who has helped the couple the most is rewarded by the biggest payoff, with Doug shoveling bills at him. The same years saw the consolidation of the “American style” of staging, shooting, and cutting scenes. (For more on this trend, see our earlier entries here and here.) 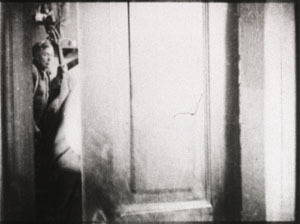 Fairbanks’ films from 1916 to 1920 display a growing mastery of continuity techniques; the style coalesces under our eyes. The system depended on breaking up master shots into many closer views. This practice was less common among European directors of the time, who might supply inserts of printed matter like letters but did not usually dissect the scene into shots of different scales. In His Picture in the Papers, for instance, we get a master shot (nearer than it would be in a European picture) of Melville paying court to Christine, followed immediately by closer views that show their expressions. Very quickly directors realized that you didn’t need a master shot if you planned your shots carefully. In Flirting with Fate, the artist Augy is chatting with Gladys, while her mother and her rich suitor watch from another part of the room. No long shot presents both pairs. The mother summons Gladys, and when she and Augy rise, director Christy Cabanne cuts to another shot of them, moving into the frame. This is a very rare option in most national cinemas of the period, which would simply frame the couple in a way that allowed them to rise into the top of the same shot. Now Gladys hurries out, crossing the frame line. This exit matches her entrance on frame left, meeting her mother. Such a scene is obvious by today’s standards, but a revelation at the time—a way of lending even static dialogue scenes a throbbing rhythm that absorbed viewers. Around the world, notably in the Soviet Union, young directors saw this as the cutting-edge approach to visual storytelling. The new style was as probably as exciting to them as the powers of the Internet are in our time. 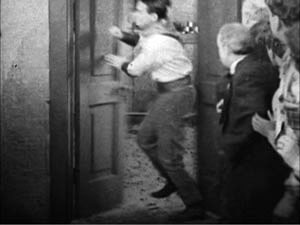 Because of analytical editing, the cutting pace of American films of the late 1910s is remarkable, and the Fairbanks films, with their strenuous tempo, are fair examples; the average shot length in these films ranges between 4 seconds and 6.6 seconds. With so many shots, production procedures emerged to keep track of them. To a certain extent shots were written into the scenarios Loos refers to, but directors also broke the action up spontaneously during filming. The cameraman, and later a “script girl,” would log the shots during shooting so that they could be assembled correctly in the editing phase. Directors were still refining the system, though, as we can see from an awkward passage of shot/ reverse shot in A Modern Musketeer. The eyelines are a bit out of whack, but odder still are the identical backgrounds of the two shots. Evidently director Allan Dwan made these shots quickly and closer to the canyon rim, in the expectation that nobody would notice the disparity. Point-of-view shots were easier to manage, and they could intensify the drama. Later in A Modern Musketeer, the rapacious Chin-de-dah tells the white tourists he’s getting married. To whom? asks Elsie. Instead of answering, “You,” he holds up his knife. Sometimes you suspect that filmmakers were multiplying shots just for the fun of it. The early Fairbanks films are vigorous to the point of choppiness; action scenes spray out a hail of images, some offering merely glimpses of what’s happening. Wild and Woolly is especially frantic, with the final sequences of kidnapping, gunplay, and a ride to the rescue breathless in their pace. In the course of it, Emerson realizes that fast action needs some overlapping cuts to assure clarity. Doug bursts through a locked door in one shot, and from another angle, we see the door start to open again. Only a few frames are repeated, but the movement gains a percussive force. Doubtless the Russians studied cuts like this; Eisenstein made the overlapping cut part of his signature style. By contrast, The Mark of Zorro and its successors have calmer pacing. Doug’s acting got more restrained too, with his bounciness largely confined to the action scenes. Already in 1920, high-end pictures were finding a more academic look, a polished and measured style. 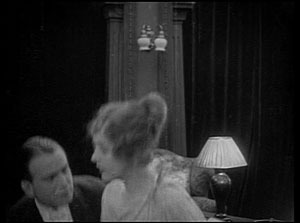 Dialogue titles became more numerous, and big sets and other production values were highlighted. I’ve been able to sample only a few points of interest in the early Fairbanks output. 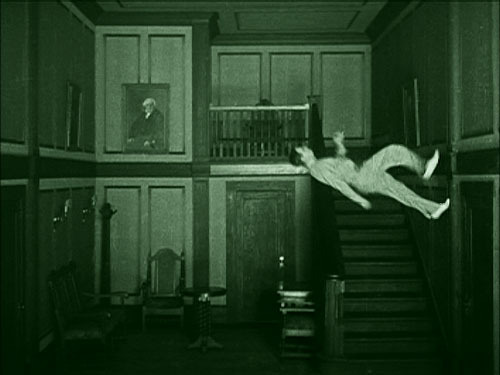 I haven’t talked about Fairbanks’ foray into Sennett-style farce, the cocaine-fueled Mystery of the Leaping Fish (1916), or the bold experimentation of the cinematography in the dream sequence of When the Clouds Roll By. My point is just to note that these films radiate exuberance—not only in their hero but in their very texture. Scene by scene, shot by shot, Doug’s energy is caught by an efficient, pulsating style that was an engaging variant of what would soon become the lingua franca of cinematic storytelling. 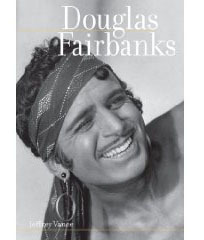 For other reading on Fairbanks, you can consult Alastair Cooke’s Douglas Fairbanks: The Making of a Screen Character (New York: Museum of Modern Art, 1940), one of the earliest and still most thought-provoking studies; John C. Tibbetts and James M. Welsh’s His Majesty the American: The Films of Douglas Fairbanks, Sr. (South Brunswick, NJ: A. S. Barnes, 1977), which is wide-ranging and strong on the early films; Booton Herndon’s Mary Pickford and Douglas Fairbanks (New York: Norton, 1977); and Douglas Fairbanks: In His Own Words (Lincoln, NE: iUniverse, 2006), a collection of interviews and essays signed (but probably mostly not written) by the star. I’ve also been enlightened by Lea Jacobs’ essay “The Talmadge Sisters,” forthcoming in Star Decades: The 1920s, ed. Patrice Petro (Brunswick: Rutgers University Press, forthcoming). 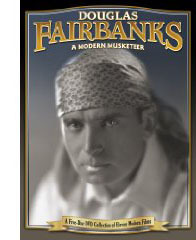 Online, there is much information at the Douglas Fairbanks Museum site. (1) Kristin Thompson, “Fairbanks without the Mustache: A Case for the Early Films,” in Sulla via di Hollywood, ed. Paolo Cherchi Usai and Lorenzo Codelli (Pordenone: Biblioteca dell’Immagine, 1988), 156-193; David Bordwell, Narration in the Fiction Film (Madison: University of Wisconsin Press, 1985), 166-168, 201-204. (2) This set is very well chosen, but there are enough other films surviving from this period to warrant another box. It could include The Lamb (1915), Double Trouble (1915), The Good Bad Man (1916), Manhattan Madness (1916), The Americano (1916), Down to Earth (1917), The Man from Painted Post (1917), His Majesty the American (1919), and The Half Breed (1916), in which Fairbanks plays a biracial hero. On the matter of race, the films in the collection aren’t free of condescension and stereotyping, but there are also moments of affection between Fairbanks and Native Americans. He had extraordinarily dark skin, a fact he apparently took in his stride. (3) I believe that this print is from a different version than the one I’ve known before; a few shots seem to show slightly different angles. (Perhaps the earlier one was from a foreign negative?) An informative page of the Flicker Alley booklet signals the provenance of the prints. While I’m on the subject, I should mention that occasionally the framing seems a bit cropped, but that could be due to the source material. 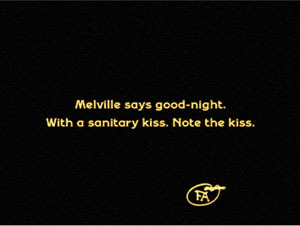 (4) Loos, Kiss Hollywood Goodbye (New York: Ballantine, 1974), 2. (6) Loos, Kiss Hollywood Goodbye, 14. 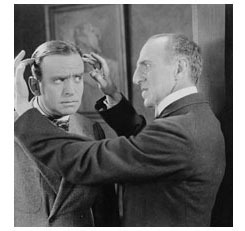 (7) Emerson and Loos, Breaking into the Movies (Philadelphia: Jacobs, 1921), 43. PS 30 Nov: Internets problems and a memory lapse kept me from mentioning two other important books on Anita Loos: Gary Carey’s lively biography Anita Loos (Knopf, 1988) and Anita Loos Rediscovered: Film Treatments and Fiction, ed. and annotated by Cari Beauchamp and Mary Anita Loos (University of California Press, 2003). Both Carey and Beauchamp echo Loos’ claims that the couple split from Fairbanks because he was somewhat envious of the attention they received, while Carey adds that Fairbanks wanted to break out of the “boobish” parts Loos wrote for him (p. 50). PPS 8 Dec: Mea culpa again. I overlooked Richard Schickel’s book-length essay, His Picture in the Papers: A Speculation on Celebrity in America, Based on the Life of Douglas Fairbanks, Sr. (New York: Charterhouse, 1973). It’s a lively and thoughtful argument that Doug was one of the very first modern celebrities, and one who enjoyed his role as such. This entry was posted on Wednesday | November 26, 2008 at 1:10 pm	and is filed under Actors: Fairbanks, Actors: Hart, FILM ART (the book), Film genres, Film history, Film technique, Film technique: Editing, Hollywood: Artistic traditions, Narrative strategies, Screenwriting, Silent film. Responses are currently closed, but you can trackback from your own site.